FAIRFIELD, Calif. -- Chris O'Connell called it the "scariest moment of my life." The 23-year-old Australian, who was trying to qualify for the $100,000 Northbay Healthcare Men's Pro Championships, had been evacuated with his coach and their host family on Sunday night as wildfires raged in nearby Napa. But as O'Connell and coach David Moore of Australia headed to Greenbrae in the San Francisco Bay Area, they encountered a wall of flames 200 yards ahead. "We were going down a highway through a valley with bushland on either side, and we weren't sure if we were heading straight into another fire, and we literally were," O'Connell exclaimed on Tuesday. 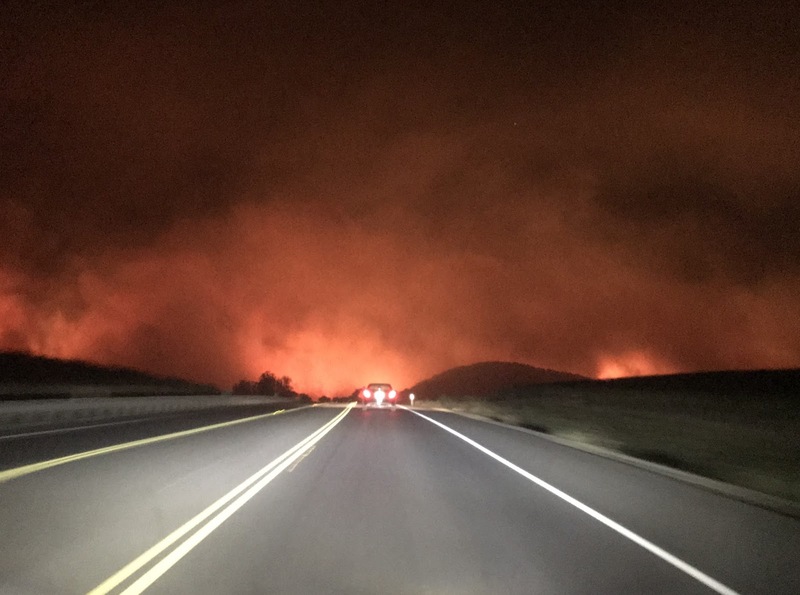 "There was another fire near Sonoma, so we quickly turned around and went a different route to Greenbrae, but it was really scary. It was the scariest moment of my life. I got to sleep about 3 a.m. and was playing the next morning at 10, so it was a crazy 24 hours. I'm all settled now." Seventeen blazes in Northern California's wine country have killed least 15 people and destroyed about 1,500 buildings, including including two wineries and hundreds of homes, NPR reported. The fires, spread by dry conditions and high winds, have burned about 115,000 acres, authorities said. The cause has not been determined. O'Connell and Moore stayed one night with the host family of fellow Aussies Matthew Barton and Greg Jones in Greenbrae, 16 miles (25.7 kilometers) north of San Francisco, before going back to the family that housed them in Tiburon two weeks ago. Tiburon is 48 miles (77.2 kilometers) southwest of Solano Community College, the site of this week's tournament. Moore said his and O'Connell's host family in Napa, Marty and Dave Thomas "heard third-hand that their house is OK, but they can't get in the area." Other players, as well as ballkids and co-tournament director Phil Cello, also were evacuated. Some ballkids have canceled, said co-tournament director Raf Rovira. Cello lives in Green Valley, over the hill from Solano Community College, and is staying at a son-in-law's house in nearby Vacaville. "We loaded up our four dogs and two cats and all our stuff and headed out," Cello said. "We left at 4 a.m. by the time we got packed up." Cello said he hopes his house is OK and doesn't know when he can return, then added: "It's fine. It's precautionary. The fire is in Napa on the other side of the hill. The danger is if it comes over the top. My home is near the base of the hill. The danger is that the wind is supposed to pick up again tonight. The fire in Napa has zero percent containment. We just have to hope the wind doesn't pick up so much that it lifts the fire over the hill and into the homes below." Smoke enveloped Fairfield in the morning, and USTA on-site supervisor Keith Crossland came close to postponing play. He consulted ATP senior supervisors and medical staff by telephone and e-mail and a website that listed the air quality as moderate. "It was certainly smoky, but the website was the thing that pushed me over to go ahead and play," Crossland said. "There is no ATP rule saying there's air quality 'X' above which you don't play and below which you can play. It's ultimately the (on-site) supervisor's decision." Crossland also noted: "The ATP plays events in some cities that have reputations for pretty bad air quality like Beijing, Shanghai and Mexico City. I've never been there, so I couldn't say this is worse than that, but my feeling is this is not as bad as that." Players seemed unaffected by the smoke on Tuesday morning, and the air was much clearer in the afternoon. O'Connell, who had ousted top qualifying seed Liam Broady of Great Britain in the second round, battled fatigue and the smoke in the last round on Monday morning but beat No. 5 seed Jay Clarke of Great Britain 6-3, 7-5 in straight sets. "Obviously, I felt pretty drained walking on the court," said O'Connell, who had slept 3 1/2 hours. "My eyes were watering, really hurting, and my throat was sore just from breathing in all the smoke. Once I got into the match, all that kind of disappeared because I'm a competitive guy. I just wanted to compete." O'Connell also upset American Denis Kudla, a former top-70 player, 7-5, 6-3 on Tuesday morning. The victory was especially gratifying because O'Connell missed most of the summer with pneumonia. "I've really only come good in the past month and a half," said O'Connell, who has plunged from a career-high No. 219 in February to No. 375. "It's really good to start getting a couple wins and feeling good on the court." O'Connell was worried about the smoke before facing Kudla, unnecessarily as it turned out. "Surprisingly, I felt good warming up and playing the match, maybe because I was winning," he said. O'Connell will meet another former top-70 player, 31-year-old German Tobias Kamke, today in the second round. One seed lost on Tuesday, and three others survived scares. No. 6 Stefan Kozlov, 19, fell to Mackenzie McDonald, a 22-year-old product of Piedmont in the Bay Area, 6-4, 5-7, 6-1 in a matchup of U.S. prospects. No. 2 Tennys Sandgren in the Nashville area edged fellow American Mitchell Krueger 6-2, 6-7 (2), 7-6 (5) in a battle that ended in near-darkness at 6:43 p.m. Krueger had the match on his racket when he led 5-4 in the tiebreaker with two points on his serve coming. No. 3 Bjorn Fratangelo of Orlando, Fla., trailed by a set and a service break before rallying to beat lucky loser Alexander Ward of Great Britain 3-6, 7-6 (5), 6-4 in two hours, 28 minutes. Also, No. 9 Michael Mmoh, 19, nipped wild card Evan King, a 25-year-old left-hander, 6-1, 4-6, 7-6 (5) in another all-American affair. Top seed Ernesto Escobedo of West Covina in the Los Angeles area and Sandgren, from Gallatin, Tenn., in the Nashville area, are the only two top-100 players in the tournament at No. 91 and No. 98, respectively. Mmoh received the ninth seed after No. 5 Cameron Norrie of Great Britain withdrew because of a left shoulder strain. Norrie defeated Mmoh in the semifinals of last week's $100,000 Stockton Challenger en route to his second title in two weeks. The 22-year-old left-hander also won Tiburon. Fourth-seeded Maximilian Marterer of Germany downed Brydan Klein of Great Britain 6-4, 7-6 (2). Marterer reached last year's Fairfield quarterfinals and won last week's $100,000 Monterey (Mexico) Challenger. Klein advanced to the Fairfield semifinals in 2016 and won the Stockton doubles title with countryman Joe Salisbury last week. Here are the Fairfield singles and doubles draws and Wednesday's schedule. The tournament is being streamed live.